DarkArtsBooks » MIGHTY UNCLEAN subverts the masses! This entry was posted by John Everson on Sunday, July 26th, 2009 at 9:25 pm	and is filed under News, Uncategorized. You can follow any responses to this entry through the RSS 2.0 feed. Responses are currently closed, but you can trackback from your own site. 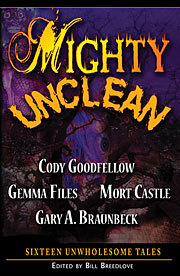 Dark Arts Books’ fifth anthology since 2006, Mighty Unclean debuted in a preview edition at the 2009 Bram Stoker Awards Weekend last month in Burbank, CA…..